There is no question that energy generation impacts on landscape, both urban and rural. It always has. The current re-engineering of systems towards renewable energy is, on one level, not different. Wind turbines are just one example around which there is a very polarised debate. As a result there has been considerable work done in Scotland on the visual as well as environmental impact. Sophisticated modelling of proposed installations in landscape contexts has become a normal part of public consultation processes. There is now for instance a mobile virtual landscape theatre, developed by The James Hutton Institute. Behind the issues of visual and environmental impact there is a significant public policy commitment in Scotland. This public policy commitment drives funding and decision-making to deliver on the targets. It is intended to shape or focus the market on agreed public priorities. The Land Art Generator Initiative comes at these issues from a different perspective. The initiative seeks to engage artists, architects and designers in the development of mid and large scale renewable energy infrastructure. The first international design competition focused on the United Arab Emirates and was sponsored by Madsar, “Abu Dhabi’s multi-faceted initiative advancing the development, commercialisation and deployment of renewable and alternative energy technologies and solutions”. The Time Is Now documents the winners and runners up, and a total of 51 of the hundreds of entries. This articulation of the challenge does not perhaps fully recognise the complexity of the issue in, for instance, Scotland. As suggested above, and we’ll return to below, it is not merely in proximity to neighbourhoods that the challenge arises: wind generation installations even in fairly remote locations will stoke the debate. There is also precedent for the involvement of architects, artists and designers in mid and large scale energy infrastructure. Tate Modern was a power station located in the heart of London, and there was considerable debate about the location, which in the end was driven by an energy crisis. The reason why the new use was sought for the Bankside Power Station was precisely that it was a building of considerable architectural merit. Bankside was designed by Sir Giles Gilbert Scott who was also the architect of Liverpool Cathedral as well as the eponymous red telephone box. Whilst it is perhaps self-evident that at various points in history artists and designers have been asked to address large scale energy generation installations, it is interesting to think that the best examples are of such importance that they become art galleries. The metaphor employed for the design of power stations at the time was the cathedral of power, intending to emphasise the prestige and modernity of electricity (see the Greater London Industrial Archaeology Society papers for references). The metaphors that drive these proposals are relevant to reflect upon. Lakoff and Johnson’s Metaphors We Live By (2003) clearly articulates the importance of not just those rhetorical metaphors such as associating power stations with cathedrals, but the more embedded metaphors of architecture and conflict that underpin so much language and thought, and therefore planning and action. Beth Carruther’s essay ‘Possible Worlds’, included in The Time Is Now, addresses this important point. Within the suite of proposals included in The time is now there is a cluster of power metaphors: the winning team’s proposal Lunar Cubit uses the form of pyramids; there’s a team who’s proposal Solar Eco System uses a depiction solar system (arranged as it was at the point that the United Arab Emirates came into existence in 1971). There’s another cluster of nature metaphors: the second placed team’s Windstalk proposal looks very much like a field of grass; Solarbird references sea waves, birds, fish and trees; Fern (future/energy/renewable/nature) also applies a natural form to a photovoltaic array. A significant number of proposals explored the shape and pattern of dunes in their proposals. And there is a cluster of indigenous culture metaphors: Solaris deploys the photovoltaic array referencing decorative patterns in local culture – the blue colour of the panels accentuates the reference, and this patterning also appears in PV Dust. Another team also named their proposal Solaris, but drew on a tent metaphor. Whilst The Time Is Now is full of illustrations, almost all using the same sorts of landscape visualisation tools mentioned above, there are other aspects of impact, in particular cultural impact that cannot be effectively captured through architectural and landscape design technologies. Robert MacFarlane, one of those currently reinvigorating landscape writing in the UK, unpacks the complexity of cultural impacts in his essay A Counter-Desecration Phrasebook (2010). His subject is the Brindled Moor on the Isle of Lewis in the Outer Hebrides. The context of his writing is the proposal for a wind ‘power station’ of 234 turbines each 140 metres high with a blade span of 80 metres (the terminology of ‘farm’ seeks to elide the reality: these installations are dispersed power stations). MacFarlane reports that each turbine required a foundation of 700 cubic metres of concrete and goes on to note that, “5 million cubic metres of rock and 2.5 million cubic metres of peat would be excavated and displaced”. The arguments for and against this development rotated around issues of landscape value, not merely visibility. On the one hand MacFarlane quotes the writer Ian Jack, in support of the installation, described the interior of Lewis as, “a vast, dead place: dark brown moors and black lochs under a grey sky, all swept by a chill wet wind”. MacFarlane highlights the cultural value and complexity of the landscape, challenging its dismissal as a ‘dead place’. He explores in detail the richness of language associated with this landscape, his starting point being to challenge the idea that this is terra nullius. Of course one of the key points he is making is that most colonisation is based on the principle of terra nullius, and that one of the key forms of counter by indigenous peoples in, for instance, Australia, New Zealand and Canada, is to demonstrate the deep connection to land. MacFarlane goes on to argue that this landscape of “…peat-bog, peat-hag, heather, loch and lochan…” has a rich and deep language associated with it. He directs the reader’s attention to the text Some Lewis Moorland Terms: A Peat Glossary prepared by Finlay MacLeod, and containing 126 terms. MacFarlane celebrates the saving of the moor and the rejection of the energy generation installation which would have, in his view, desecrated the place. 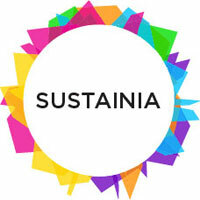 If we are to make intelligent decisions about how and where to build mid and large scale renewable energy installations, then we definitely need artists, architects and designers to contribute to the development of schemes that acknowledge the aesthetic impacts, and actively seek to create beauty as well as functionality. But we also need to assure that the locations are not treated as terra nullius or without cultural meaning. The tools are not just those of landscape visualisation, they are also of landscape language and lived experience. Engaging and embracing cultural meaning, perhaps in deeper ways than simple symbolism, could lead to imaging more interesting solutions, whether that’s for a piece of desert, moorland or for a settlement – village or city. The Land Art Generator Initiative operates on a biennial cycle, and the current round focuses on Fresh Kills, a former landfill site on Staten Island in New York City. This location is now of deep cultural significance, being the place that the remains of the World Trade Center was deposited post 9/11. It’s also a place that has been the focus of work by the artist Merle Laderman Ukeles for many years. You can purchase your copy of The time is now here http://www.kinokuniya.com/sg/index.php/fbs003?common_param=9789814286756 . Evans, G. & Robson, D. (2010). Towards Re-Enchantment: Place and its Meanings. ArtEvents: London. Lakoff, G. & Johnson, M. (2003). Metaphors We Live By (2nd Edition). University of Chicago Press: Chicago and London. Matt Ridley is the author of a number of books on the subjects of evolution, genetics and society, and has been variously a scientist, journalist and businessman. There was an article in Saturday’s Times and the full version is on Matt Ridley’s website. It’s worth reading. 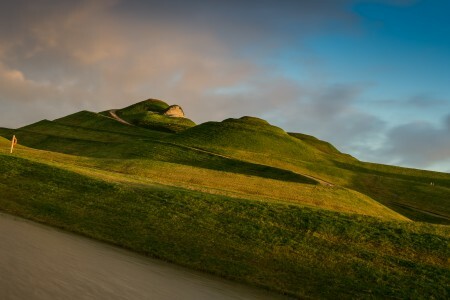 His family leased land to a mining operation in the North East of England and have sponsored Charles Jencks to create Northumberlandia, the latest of Jencks’ earthworks. Ridley makes an argument around energy and land. It’s an economic argument about fossil fuels and land use. The replacement of muscle power, burning carbohydrates, with fossil power, burning hydrocarbons, has been one of the great liberators of history. Unfortunately the argument doesn’t look to the future. It is true that fossil fuels have transformed society, but that’s the transformation of the industrial revolution. The current transformation is focused on renewable energy and the need to massively reduce our footprint. And in terms of art practices, this is not innovative, just large. Cutting edge art practices look to integrate the future into the landscape, not just shape it aesthetically. Whether it’s AMD&ART addressing Acid Mine Drainage, or the Land Art Generator Initiative bringing together at scale renewable energy and art, or any of a number of other artists working on energy and land futures (see greenmuseum.org for examples), Northumberlandia misses a trick and a big one. The creation of new public space is important, but the use of that process to exemplify new futures is vital. Saturday 28th August 2012. Staten Island, NY. LAGI invites the general public to join them for an anonymous preview of the submissions to the 2012 LAGI NYC design competition for Freshkills Park. 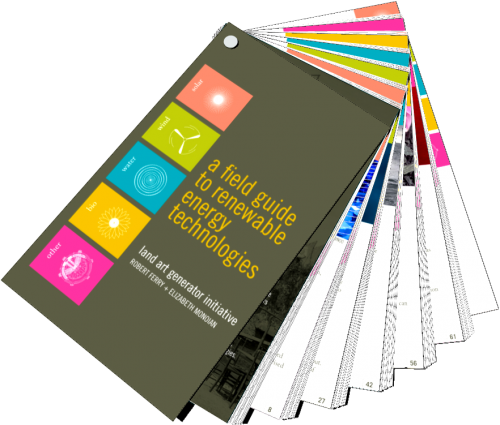 They will also be providing free copies of the new version of A Field Guide to Renewable Energy Technologies, a book that details all of the different methods by which clean energy can be safely harnessed from nature. Since it became available in February, this free online PDF has been downloaded over 60,000 times! A few changes to the PDF have been made in the past week and so you may want to consider replacing yours with this newly improved version. Orders are being taken from those who are interested in a printed copy ($20). It will look exactly like the image above and will make a great looking and useful accessory. If you’re interested in receiving a copy, please fill in the number of copies in the form below and click “Order Now”. We’ll be shipping copies in mid July 2012. 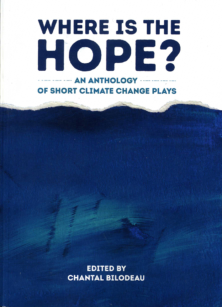 You can also come to one of our events this summer, where we will have copies available. If you are an institution and interested in purchasing more than 10 copies, please get in touch with us and we will provide a great bulk discount. Email us at lagi@landartgenerator.org. If you have any trouble completing your order, please let LAGI know. All proceeds go to Society for Cultural Exchange in support of the Land Art Generator Initiative. “At 2,200 acres, Freshkills Park will be almost three times the size of Central Park and the largest park developed in New York City in over 100 years. The transformation of what was formerly the world’s largest landfill into a productive and beautiful cultural destination will make the park a symbol of renewal and an expression of how our society can restore balance to its landscape. The design brief is similar to that of the 2010 edition. In summary, LAGI 2012 is an ideas competition to design a site-specific public artwork that, in addition to its conceptual beauty, has the ability to harness energy cleanly from nature and convert it to electricity for the utility grid. The expansiveness of the design site at Freshkills Park presents the opportunity to power the equivalent of thousands of homes with the artwork. The stunning beauty of the reclaimed landscape and the dramatic backdrop of the Manhattan skyline will provide an opportune setting from which to be inspired, and it offers the perfect environment for a showcase example of the immense potential of aesthetically interesting renewable energy installations for sustainable urban planning. 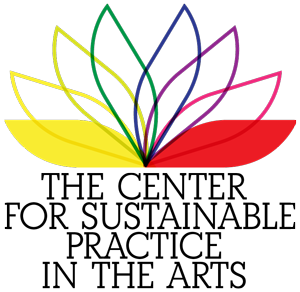 The monetary prize award ($15,000 First Prize, $4,000 Second Prize, $1,000 High School Edition Winner) will not guarantee a commission for construction; however, LAGI will work with stakeholders both locally (NYC) and internationally to pursue possibilities for implementation of the most pragmatic and aesthetic LAGI designs. The Land Art Generator Initiative (LAGI) aims at designing public art installations that have an additional benefit of large scale clean energy generation. Each sculpture can continuously distribute clean energy into the electrical grid and thus potentially provide power to thousands of homes. 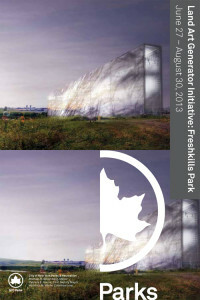 In 2012 the Land Art Generator Initiative holds a design competition for a site within Freshkills Park (the former Fresh Kills Landfill) together with New York City’s Department of Parks & Recreation in New York City. LAGI 2012 is an ideas competition to design a site-specific public artwork that combines beauty with utility of generating electricity. The beauty of the reclaimed landscape and the backdrop of the Manhattan skyline are promising settings for an aesthetic and sustainable urban planning of the area. The competition is open to everyone. 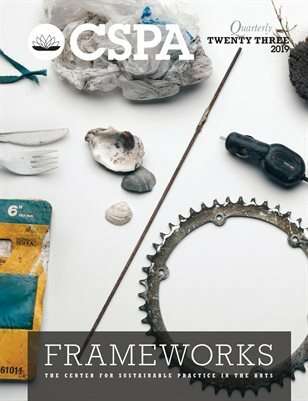 Designers, artists, engineers, architects, landscape architects, university students, urban planners, scientists are encouraged to send their submissions. 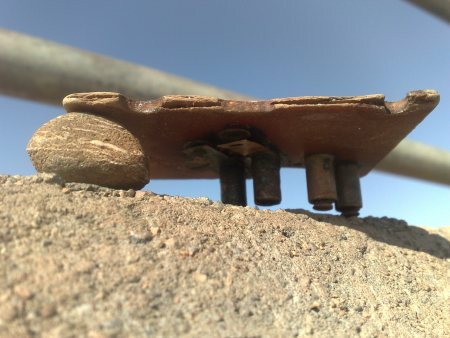 If there are further questions, please send an email to lagi [at] landartgenerator [dot] org.